Directed by Barbara Attie, Janet Goldwater and Sabrina Schmidt Gordon. USA. 2015. 90 min. 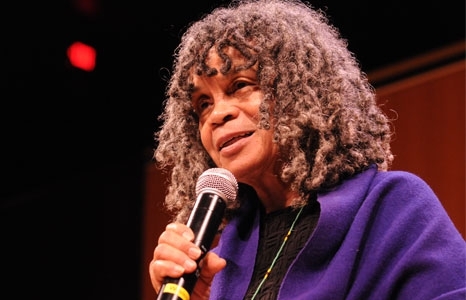 For 80-year-old Sonia Sanchez, writing is a personal and political act. She emerged as a seminal figure in the 1960s Black Arts Movement, raising her voice in the name of black culture, civil rights, women's liberation, and peace as a poet, playwright, teacher, activist and early champion of the spoken word. Deemed "a lion in literature's forest" by poet Maya Angelou and winner of major literary awards, including the American Book Award, Sonia Sanchez is best known for 17 books of poetry that explore a wide range of global and humanist themes, particularly the struggles and triumphs of women and people of color. In BaddDDD Sonia Sanchez, the writer’s life unfolds in a documentary rich with readings and jazz-accompanied performances of her work. With appearances by Questlove, Talib Kweli, Ursula Rucker, Amiri Baraka, Haki Madhubuti, Jessica Care Moore, Ruby Dee, Yasiin Bey, Ayana Mathis, Imani Uzuri and Bryonn Bain, the film examines Sanchez's contribution to the world of poetry, her singular place in the Black Arts Movement and her leadership role in African American culture over the last half century.